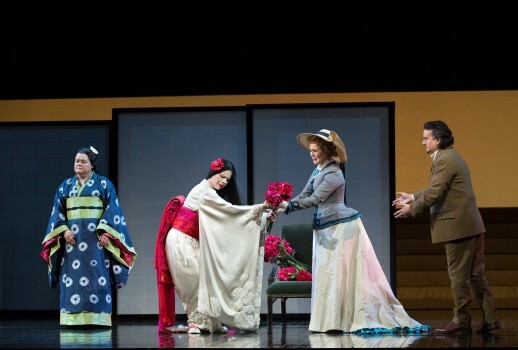 After first Patricia Racette, then Hei-Kyung Hong withdrew, “the third time’s the charm” when Ana Maria Martinez’s tremendously impressive Cio-Cio-San dominated the season premiere of Puccini’s Madama Butterfly at the Met. Though Martinez frequently appears at most major U.S. houses as well at many European companies, her absence from the Met roster since her 2005 debut as Micaëla had left many stumped. I had never heard her live but missed her Met return last fall as Musetta. However, I was grateful to experience her marvelous Butterfly Friday which revealed just how much New York audiences have been missing. The late Anthony Minghella’s ravishing stylized production, lovingly revived by its choreographer Carolyn Choa, Mingella’s widow, provided the perfect framework for Martinez’s admirably restrained Butterfly. Hers was a forthright, intelligent geisha, wise beyond her years, who calmly took charge of her own destiny. Fixing her belief in a bright future on a charming but unworthy man became her tragedy. Sometimes Butterfly can be excruciating—its hapless heroine mercilessly beaten down until she kills herself—but Martinez conjured such moving nobility that one admired this Cio-Cio-San as much as one pitied her. Although its top lacked bloom, Martinez’s opulent dark soprano was seductively warm and enveloping in its crucial middle register. Her somewhat tentative entrance aria was capped by a slight but true high D-flat, but from then on she was on commanding form, eschewing the annoying child-like inflections adopted by some sopranos to characterize Cio-Cio-San’s extreme youth. Only Martinez’s mincing gamboling about the stage occasionally detracted from her otherwise fully realized portrayal. “Un bel di” began quietly and built inexorably to a powerful climax while her grave “Che tua madre” throbbed with emotion. Perhaps because it was set far back on the bare stage, her “Tu, tu, piccolo Iddio” lacked impact, but her dignified, generous greeting of Kate as the happiest woman on earth proved devastating. Martinez had sung Rusalka in Houston on February 10, so she had barely a week at the Met to rehearse this complex production. That she gave such a formidable performance was a testament to her confident, mature artistry. Losing his scheduled soprano ten days before his Met debut must have caused anxiety for conductor Karel Mark Chichon, but only some minor stage-pit coordination problems, particularly in act I, surfaced. Chichon was particularly attentive to and supportive of his late-arriving prima donna who clearly had her own definite ideas about phrasing, particularly in spinning out some bewitching high pianissimi. Otherwise Chichon’s reading was fleet, lush and expansive drawing supple if occasionally erratic playing from the Met orchestra. Of the other principals, Polish baritone Artur Rucinski, another debutant, as Sharpless stood out for his appealing, supple baritone and sympathetic manner. One hopes he will return in more challenging repertoire, perhaps giving an overexposed compatriot some time off. Tony Stevenson repeated his slimy Goro and Tyler Duncan showed promise as Yamadori but Ricardo Lugo was mostly inaudible as the Bonze. Roberto De Biasio, whom I had previously admired at the Met as Gabriele Adorno and Ernani, made a conscientious but underpowered Pinkerton, his sweet secure tenor sounded much reduced in volume from those previous appearances. His superficial acting meant he joked uncomfortably with Sharpless and gingerly pursued his swooning bride. In the final act his callow, awkward anguish at his betrayal of Cio-Cio-San made the caddish American sailor even more despicable than usual. Friday was the Minghella production’s 57th performance since its premiere in 2006 and Maria Zifchak has been its Suzuki in all but six. Though she remains a touchingly devoted servant, her mezzo has become increasingly pinched and harsh and it stubbornly refused to blend with Martinez’s in the Flower Duet. She is scheduled for the remaining 12 Butterflys this season but shouldn’t another mezzo have a chance? Elizabeth DeShong was a sumptuous Suzuki opposite Amanda Echalaz in 2014; she has since moved onto bigger things but Carolyn Sproule was recently an unusually strong Ines in Il Trovatore at the Met—maybe we could hear her Suzuki sometime? With nearly one out of every three performances this season—68 in all—a Puccini opera, everyone is suffering from “Lucca-Master Overload.” However, next season at the Met will feature “only” fifteen Bohèmes and eight Manon Lescauts. Unfortunately, Martinez is absent from the 2016-17 roster but, as much as I’m looking forward to Netrebko’s Manon, I’d gladly endure Sir Richard Eyre’s latest error a third time to see it with Martinez, who would surely be compelling in the part. 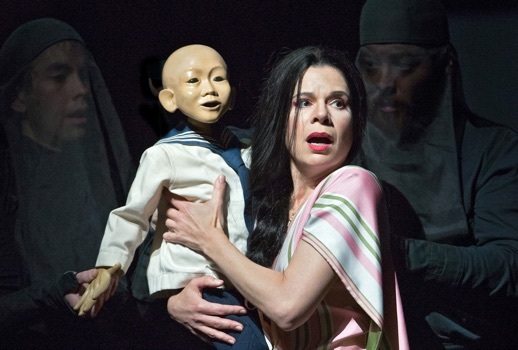 Any revival of the new Mary Zimmerman Rusalka should feature Martinez in one of her most acclaimed roles. In the meantime, however, her sole remaining scheduled Butterfly plays tonight. Who knows when she’ll be back? 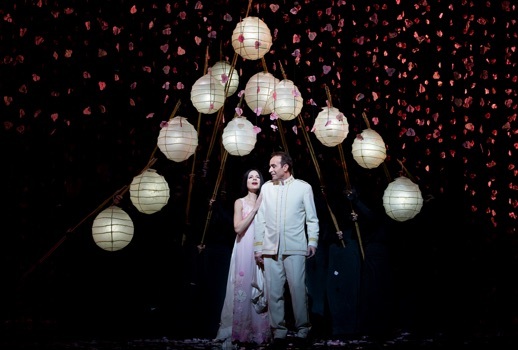 Photos by Marty Sohl/Metropolitan Opera.